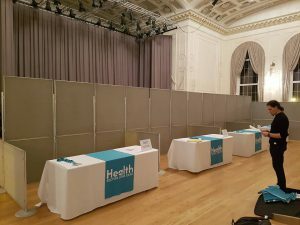 Our customer needed a shell scheme centred in one of the several rooms reserved for their recruitment expo at the Assembly Rooms in Edinburgh. They preferred our panels due to the attractive finish, neutral grey colour, and flexibility and sturdiness. The final set up requirements had to be changed a couple of times due to changes with exhibitors, but this is always to be expected, and our customer had a very successful event.